Analysis and design capability is dependent upon the product in use. 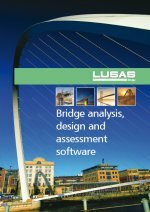 The analysis and design capabilities of particular LUSAS Bridge software products can be extended by using software options. For details see the Software Specifications. When designing your structure, multiple analyses can be defined and solved independently from within one model. This means that, in most cases, there is no need to create separate models and maintain clone copies of a model, in order to analyse and view results for different analysis requirements. The main analysis capabilities are summarised here. Stresses, strains, displacements, moments, shears and axial forces that result from static loading are easily calculated, displayed and output from any model. LUSAS supports both linear and nonlinear cable tuning analysis. Nonlinear cable tuning loadcases are for use where geometric, material or boundary nonlinearity may exist, and for use in obtaining pre-stressed states of existing structures, or for modelling catenary effects. Both cable tuning analysis facilities calculate load factors for cables in order to achieve defined target values set for various feature types or results components. An 'exact' method, an optimisation facility and two best-fit solution methods are provided. The target values facility is a post-processing tool that provides a general method of varying load factors in a linear analysis to try and achieve target values defined for particular feature types or results components. The target values loadset created is similar to a combination, but the load factors are automatically calculated by the program in response to the defined targets. LUSAS carries out elastic critical buckling, which is required for the calculation of member resistances. Often it is also required by some codes to determine if a second-order analysis needs to be carried out. If so, a full nonlinear buckling analysis can be undertaken. For existing structures, assessment or load rating to regional design codes can give conservative results showing they �fail� buckling checks, but detailed buckling analysis with LUSAS can often reveal additional �hidden� capacity and prove a load capacity. 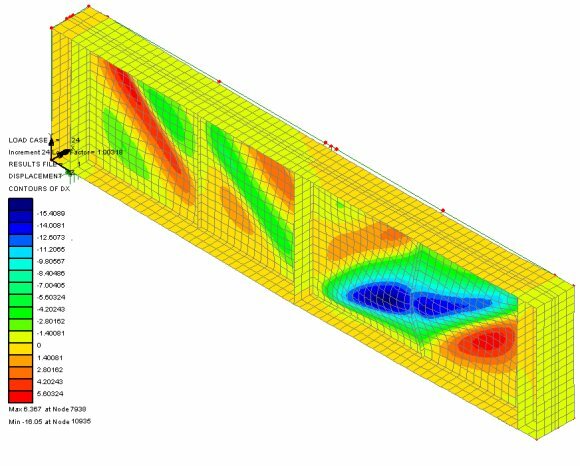 For new plate girder, box or tub girder bridge designs, linear and nonlinear buckling analysis using LUSAS can investigate the girder stability during erection, look at the effects of a slab casting sequence, and also help to optimise the size of the web and flange plates, bracing, stiffeners and position of any temporary supports used. See Linear and Nonlinear Buckling Analysis for more information. Fatigue calculations can be carried out using the total life approach. Fatigue life may be expressed in terms of the damage that is done to the structure by a prescribed loading sequence or as the number of repeats of a sequence that will cause failure. 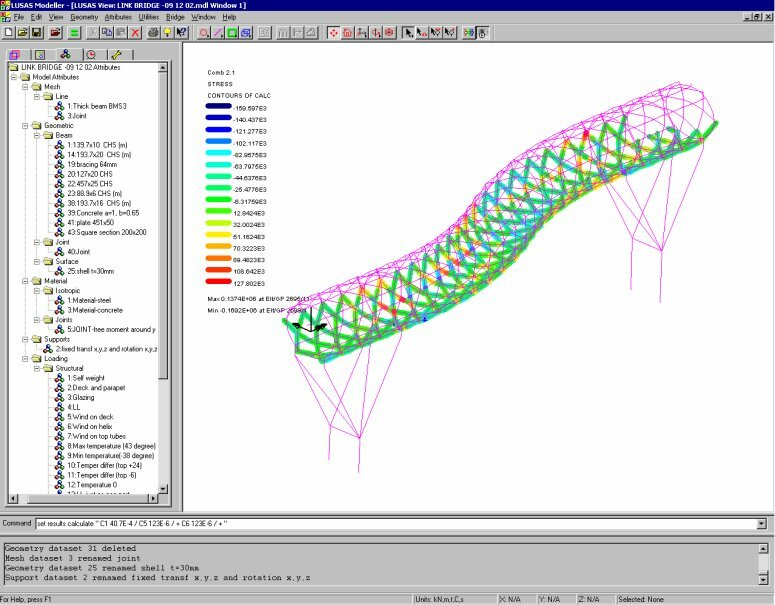 Direct Method influence analysis is a general and powerful way of calculating influences for line beam, frame, grillage, slab and deck models. The effect of a specified point load is assessed at each node or grid location on a loadable area of a structure. The influence can be calculated for any results entity / component according to the elements used, as well as for user-defined results components, and can be achieved for many locations and quantities within a single analysis. LUSAS Bridge excels in solving seismic and general dynamics problems. Straightforward modal dynamics problems can be solved using Interactive Modal Dynamics (IMD) techniques which are provided in selected LUSAS Bridge products. The Dynamics software option contains the facilities required to solve a wider range of dynamic problems in the time domain with a step-by-step solution. Additionally, by combining the LUSAS Dynamic and LUSAS Nonlinear options both high and low velocity nonlinear impact problems can be solved using either implicit or explicit solution techniques. Forced response, vibration and transient dynamics problems can also be solved, if you wish, by calculating the structural response for selected loadcases using the Interactive Modal Dynamics (IMD) results processing facilities. Interactive Modal Dynamics (IMD) allows the natural vibration behaviour of a structure to be combined with a loading regime in order to calculate the dynamic response of a structure to a range of applied excitations. IMD produces results an order of magnitude faster than traditional time-step solutions. Multiple and more advanced loading events (including moving loads and nonlinear behaviour) can be modelled with the IMDPlus and additional software options. The IMDPlus software option extends the Interactive Modal Dynamics (IMD) techniques available in all LUSAS products, and which model a single loading event in a single direction, to allow multiple loading events with more advanced loading conditions to be solved. 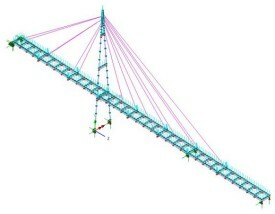 The IMDPlus option is used for two primary uses: seismic response analysis of 2D and 3D structures subjected to acceleration time histories of support motion, and for the analysis of 3D structures, such as bridges, subjected to constant moving vehicle or train loads, and moving mass and moving sprung mass. Contact nonlinearity (point and surface). The Nonlinear option can also be combined with the LUSAS Dynamic and Thermal / Field software options to solve problems in which the effects of time and temperature are important. P-Delta analysis is available for bar, beam, thick and thin shell, and 2D and 3D continuum elements with GNL capability. P-Delta analysis is an approximate geometrically nonlinear (GNL) analysis typically used to take account of the interaction between vertical and horizontal (sway) loading on tall, slender buildings. Vertical constant loads (usually dead loads) are used to form the geometric stiffness (stress stiffened) matrix for the structure; additional live load cases can then be applied and load combinations used to capture the effects of the interaction between lateral and vertical loading. 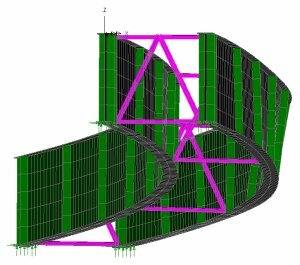 The image (right) shows just a few exaggerated deformed shapes of a beam and shell model used to carry out a staged construction analysis (incorporating creep and post tensioning) to simulate the construction of the deck of a proposed bridge across the Mississippi River. Useful geotechnical capabilities make use of a range of soil models. Residual soil stress varying with depth can be accommodated providing useful facilities for soil-structure interaction for integral bridges and culverts. Rock joints, pore water pressure dissipation, consolidation modelling, geotechnical problems involving long term excavation, construction in clays, and temporary works can all be solved. See Geotechnical / Soil-structure modelling for more information. The Thermal / Field software option contains extensive facilities for both simple and advanced steady state, and transient thermal / field analyses. By combining the LUSAS Thermal / Field option with other appropriate LUSAS options, heat transfer due to conduction, convection and radiation can be analysed. In addition, the effects due to phase change of material may also be included. Modelling of heat of concrete hydration can be carried out for a variety of cement types using the using the Heat of Hydration software option. Effects due to the addition of fly ash and ground granulated blast furnace slag can also be included. When used in conjunction with Nonlinear, Dynamic, and Thermal software options the heat of concrete hydration can be computed during a thermo-mechanical coupled analysis and the temperatures and degree of hydration can be read in to the mechanical analysis. 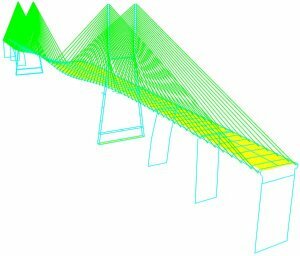 When used with the Nonlinear software option the LUSAS Rail Track Analysis software option automates track/bridge interaction analysis for light and high speed rail projects to the International Union of Railways Code UIC 774-3. It allows you to automatically build models from data defined in Excel spreadsheets, run an analysis, and quickly calculate stresses and forces induced in the track from both thermal and train loading. Parametric positioning of train loading is supported, results graphs are automatically created and exported to Excel spreadsheets, and code checking results tables are generated. The Fast Solver option comprises additional solvers for use with particular LUSAS Bridge products. The Fast Multifrontal Block Lanczos Eigensolver can, similarly, return results. several times faster than the standard Frontal Eigensolvers for certain problems.